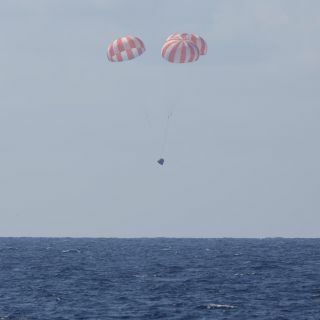 SpaceX's robotic Dragon capsule splashes down in the Pacific Ocean on May 21, 2015, bringing an end to the company's 6th cargo mission to the International Space Station for NASA. "We just got word of the successful splashdown. Congrats!" station astronaut Samantha Cristoforetti of Italy wrote on Twitter, where she tweets as‪ @AstroSamantha. NASA also signed a space station resupply deal with Virginia-based Orbital ATK; the company got $1.9 billion to fly eight missions using its Cygnus spacecraft and Antares rocket. The first two flights went well, but the third, in October 2014, ended just seconds after liftoff, when the Antares exploded. Orbital ATK is currently revamping Antares and will use United Launch Alliance's Atlas V rocket for the next Cygnus flight, which is scheduled for late 2015, and possibly for additional cargo missions as well. European Space Agency astronaut Sam Cristoforetti captured this shot of SpaceX’s Dragon cargo capsule leaving the International Space Station on May 21, 2015. “Look carefully.. you'll see #Dragon resting on the horizon,” she tweeted along with the photo. Two other unmanned freighters currently visit the International Space Station: Japan's H-II Transfer Vehicle and Russia's Progress spacecraft. A Progress launched just two weeks after Dragon, on April 28. But the Progress 59 mission failed as a result of a problem with its Soyuz rocket, and the cargo vessel burned up in Earth's atmosphere on May 7 without ever reaching the orbiting lab. Death by fire is the ultimate fate of all the resupply vessels — even those that make it to the station as planned — except for Dragon, which is built to withstand the extreme conditions experienced during re-entry to Earth's atmosphere. Another Dragon will head up to the orbiting lab soon: The next SpaceX resupply mission is currently scheduled to launch on June 26.